July 09, 2018, 1:00 p.m. 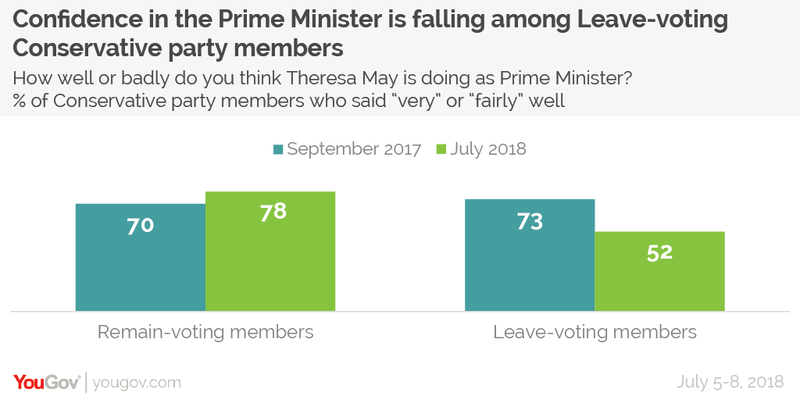 While the majority of Conservative members (60%) think Theresa May is doing well as Prime Minister, there has been a notable fall in the numbers of members who voted Leave backing the PM. While around half (52%) of Leave-voting members currently believe the May is doing a good job, this figure has fallen from 73% in September of last year. By contrast, 78% of Remain-voting members still think the PM is doing well – an increase of eight percentage points over the same time period. When should May step aside? Only 20% of Tory members want Theresa May to step down immediately, with another 9% saying she should do so in the next year. More popular choices are for the PM to step down once Britain has left the European Union (27%) or for her to remain as leader and contest the next general election (28%). Only 11% want May to step down as leader just before the next general election. Again, however, there has been a negative shift among Leave-voting members. One in four (25%) want the PM to step down immediately – in September 2017 that figure was only 6%. The majority of members (58%) believe that the government is doing a bad job of negotiating Brexit, and especially so among leave-voting members (62%, compared to 49% of Remainers). While this figure has increased among both groups since September, it has increased far faster among Leave-voting Conservatives – up 32 percentage points compared to an 11 percentage point increase among Remain-voting members. 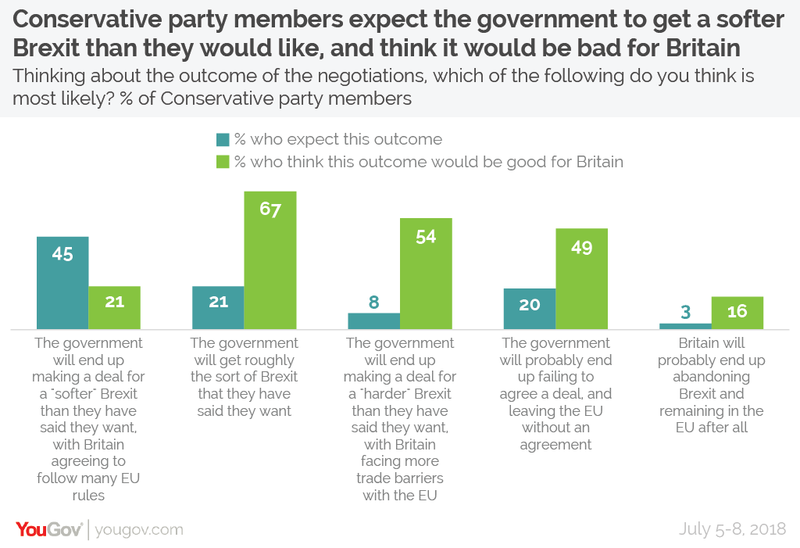 Only 9% of members want the government to soften its stance towards Brexit, yet 45% of members believe that is what is going to happen – and two thirds (65%) believe such a deal would be bad for Britain. By contrast, two thirds of members (67%) believe that the Brexit deal the government says it wants would be a good outcome for Britain, although only 21% expect the government to achieve such a deal. In fact, Conservative members are much more likely to believe that a hard Brexit (54%) or no-deal Brexit (49%) will be good for Britain than a soft Brexit (21%). Who’s best placed to be next leader of the party? With leadership contest speculation abounding, our survey looked at opinions towards some of the most likely candidates. 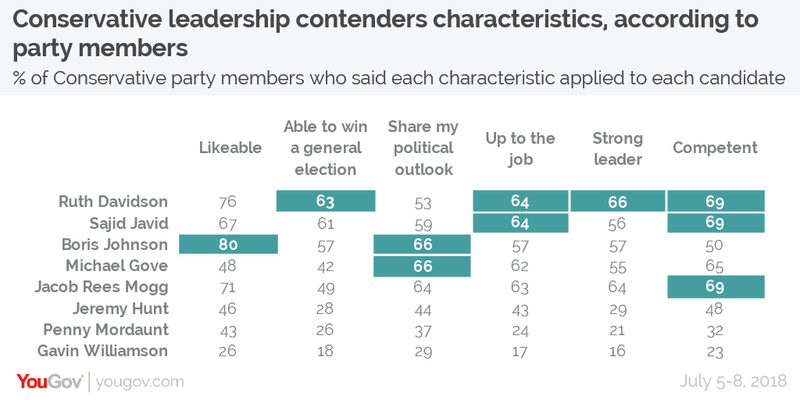 We asked members to rank eight potential leadership contenders in order of preference and using this data we can see how individual candidates compare against one another. The results reveal Jacob Rees Mogg as the most popular contestant, ranking more highly when compared to any other candidate. 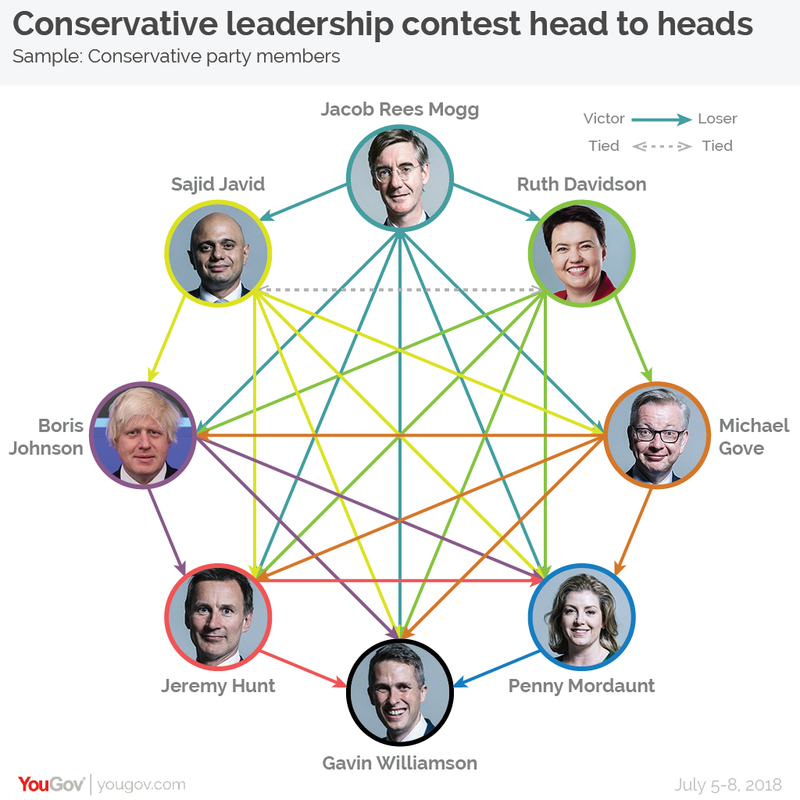 Sajid Javid and Ruth Davidson came joint second, being ranked more highly on an individual basis than all other candidates except Rees Mogg (and tying against one another). Michael Gove came fourth with four victories, including over Boris. Boris Johnson in turn comesranks more highly than only Hunt, Mordaunt and Williamson. While Rees Mogg wins a clean sweep of all his contests, he is not necessarily the most well-regarded leadership candidate. Across a range of six factors we asked members about, he is only top of the list for one: competence. Two thirds (69%) of members see Rees Mogg as competent – and here is tied with Ruth Davidson and Sajid Javid. Davidson tops three further lists – “strong leader” (66%), “up to the job” (64%, tied with Sajid Javid) and “able to win a general election” (63%). Sajid Javid ties for top place in two aforementioned categories but wins no others, while Boris tops the tables for “likeable” (80%) and “shares my political outlook” (66%, tied with Michael Gove). What to do about Boris? While the foreign secretary’s star seems to be on the wane, there is little appetite for sacking Boris, with only 17% of members thinking the Prime Minister should take this course of action. The majority think that he should be kept in place (56%) while a further 22% think he should be moved elsewhere in the cabinet. While the Labour party’s issues regarding antisemitism allegations have been more widely covered in the media, similar accusations of Islamophobia have also been levelled at the Conservative party. Only 24% of party members believe there is an Islamophobia problem in the Conservative party, however, and the vast majority of those believe it is no worse than in other parties. The majority (62%) believe that there is no such problem in the party. With ministers having come out to declare the Conservatives “the party of business” in an attempt to reassure companies after Boris was reported as having declared “f*ck business”, it would appear that the membership are broadly fine with the party’s relationship with business. A majority (57%) believe the party’s attitude towards business is about right, while 20% say it is not close enough and 18% believe it is too close. The poll is weighted by age, gender, region, and membership length. Whilst there is no public data available on the demographics on party members, we have developed these targets using data from the YouGov panel. This is a similar to the methodology that accurately predicted the previous two Labour leadership elections.